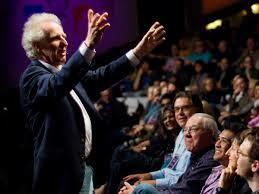 The orchestral conductor, Benjamin Zander, is a frequent business speaker and famous for his TED talk. now viewed by more than eight million people. Conductors are sometimes viewed as the last of the great dictators. Zander is different. He had an epiphany some years ago when he realized that the conductor of an orchestra is has a different role. His gifts as a teacher are remarkable too and they are now shared through masterclasses for all of us on YouTube. The students perform with technical brilliance before he enters in with a consistent message – it is time to relax and let go of the kind of competitive excellence their preparatory training has provided and instead relate to their audience. Transformation happens before our own shining eyes. His passion is for introducing classical music to audiences unfamiliar with it and he does so with incredible skill and experience in connection. It’s worth seeing him in action. The TED talk is one of the most viewed ever. A recent PBS programme showed another conductor showing a group of medical professionals how musicians work together to produce a unified and effective result. It's ironic when the arts and humanities are treated with with a condescending tone these days that their strengths are nevertheless cited as the direction in which we need to move. You can watch the recent PBS clip here. And the Zander tape is well worth your time.